Make Your Own Pumpkin Pie Spice Coffee! I've decided I don't like Pumpkin Spice Lattes anymore. This was a very hard decision for me to make (read: mostly here and here). The fact is, they are just TOO SWEET (and I think the Starbucks version tastes a bit funny, too). Now, to get the same wonderful pumpkin-spiciness in my coffee, I just add some pumpkin pie spice to my ground coffee beans in my coffee filter. And you know what? It's amazing! I don't measure, I just shake the spice in there and it flavors my coffee without any additional calories! I am still intrigued by making my own syrup for homemade Pumpkin Lattes, but for now, this is perfect. I urge you to give it a try! 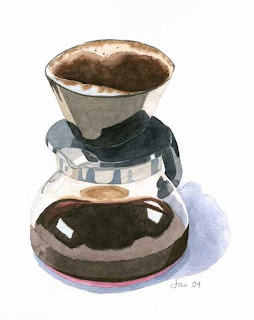 A couple of my friends add cinnamon to their coffee filter all year round. What a great way to add a little something extra to your coffee! Wednesday, October 26, 2011, 8 p.m. If you are at all interested in food, food policy, food activism etc, this is the lecture for you! I went to see Michael Pollan a couple of years ago at Goucher, and a lot of what he spoke about still resonates with me today. You will not be disappointed! In making a case for more basic, natural foods rather than “edible, food-like substances,” Pollan candidly reveals the industrialization of agriculture and highlights the growing national movement to renovate the food system. Get Your Happy Hour Specials Here! A new website has launched – http://baltimore.thedrinknation.com. 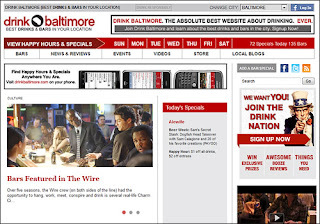 Use it to display happy hours and drink specials nearby or in any Baltimore neighborhood. You can use it as an app as well. I think this is definitely a great resource to add to your smartphone! Running a bit behind on this one, but we still have a full week left in October! Ra Sushi is partnering with the National Breast Cancer Foundation throughout this month. 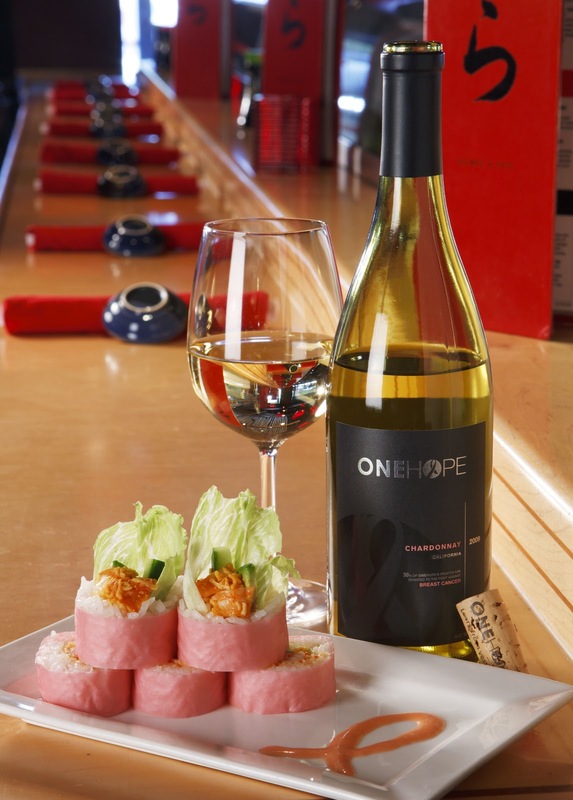 They will donate 100% of the profits from the sale of the ONEHOPE Wine and Pink Roll combination ($15) to the Foundation. The combo includes a glass of ONEHOPE California Chardonnay and the Pink Roll, which features shrimp, crab mix and sriracha combined with lettuce, avocado and cucumber wrapped in pink soy paper (!) and served with a pink ribbon of strawberry sauce. 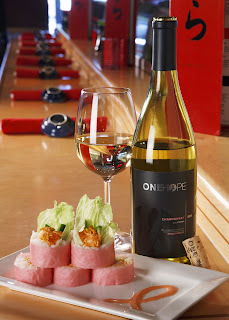 In addition this season, guests who order the ONEHOPE special and check in to RA Sushi Baltimore on foursquare will get a pink Breast Cancer bracelet! This is totally random – but very Maryland-y, so I had to post it! OLD BAY and Roma Gourmet Sausages are coming together to introduce OLD BAY Sausages. I’ve actually seen them in the stores recently but haven’t tried them – have you?? I wrote about my pre-run dinners, so what about my pre-run breakfasts at 5am? What do I eat when I am cold, disoriented and angry that I have to submit my body to this wonderful torture? Almond butter with half a bagel and a banana. Or almond butter with a thick slice of my homemade bread and a banana. Either way, almond butter was always part of my meal, so I decided to make my own! And it was the easiest thing I have ever made (my chocolate syrup comes in as a close second)!!! WARNING: Almond butter can be a bit tricky, since I've made it twice now and I had to make it differently both times. I roasted 1 cup of raw, whole almonds, dumped them on parchment paper to cool off, dumped them in the food processor and let it go for about 12 minutes until it became liquidy and creamy. That is the butter I have taken pictures of in this post. I used 2 cups of raw, whole almonds, roasted the nuts a bit too long (some were definitely bordering on burnt) and then, after cooling them, dumped them in the food processor. However, this time around, a butter did not form, just dried crumbles of almonds. So I added approximately 2 teaspoons of honey and 2 teaspoons of vegetable oil and kept processing until it formed the consistency I wanted. At the end of the day, both versions were simple and delicious, so there really isn't a perfect science to it! Real Talk: I am obsessed with Tea Rooms. They make me SOOOOOO happy! If you've never been to one, Tea by Two in Bel Air is a great place to try for your first time because it will make you as obsessed as me (well, probably not AS obsessed.....). Dan and I had a Groupon/Living Social for Tea by Two, so we were able to get two High Teas for the cost of one (usually $20pp). A High Tea consists of the following: Soup or Salad followed by assorted tea sandwiches, sweets and a warm scone. A great choice for a lunch time visit. One flaw of the menu is that it doesn't state how much tea is available to you. I found out that with the High Tea, I could try as many pots as I liked!!! This is HUGE for me because I am VERY picky about teas, so it makes it hard to commit to one! The first type that I ordered was a scented Black tea called Magical Garden - Black and Green blend of citrus, heather and lemongrass. I am 100% sure they gave me the wrong tea because I tasted a berry flavor rather than citrus, and I did not like it. Dan, who is not a fan of tea, decided to try a Rooibos, the Orange Creamsicle - Rooibos Orange and Cream. He actually liked it!!! I thought it was great as well, by itself or with one lump of sugar. The second type of tea that I tried was their Anniversary Blend - Black tea made with rose petals and pearls! I liked this so much that I ended up buying some to take home with me!! On to the food! Dan and I started with their soup of the day, a creamy crab bisque. And then we were presented with the 3 tiered delight as pictured above. Do you see my face? I'm pretty sure I smiled like that the entire time we were in that tea room. On the bottom level were 2 large butterscotch scones that I SLATHERED with sweet cream and lemon curd. The middle tier held 3 types of finger sandwiches and on top were 3 kinds of sweets (lemon cake, sugar cookie, and mini peach melbas). SO GOOD. ALL OF THEM SO GOOD. So what can I say? This place is fantastic. 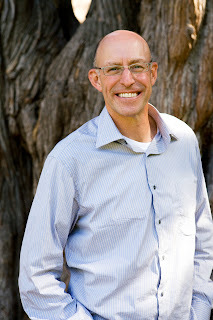 The service was amazing and incredibly friendly. The atmosphere is so charming and delightful. The food was surprisingly substantial and not-surprisingly delicious. Their tea selection was broad and unique. Their gift shop was tempting and satisfying. PHEW! Are those reasons good enough for you? If you plan to come on a Saturday - MAKE RESERVATIONS! This place is adorable, but tiny, and was quite full when we came at Noon. They are unable to seat children under 5, including infants. They have a gift shop. Plan to spend money, because you won't be able to stop yourself. Please check out the bathroom. They use a teapot wallpaper with which I would like to cover every inch of my own house. Some of you may be wondering what I like to eat before my long runs. No? None of you care? Too bad, I'm going to tell you. I am all over the place! One meal that I've had twice now to great success the next day (including my 20 mile run), is the Homemade Meat Sauce Lasagna ($9.25) from Little Taste of Italy (previously reviewed here). I am so in love with this lasagna. Their sauce is slow cooked and a bit sweet, the meat is INCREDIBLY plentiful, and there's enough food for two meals! It's also served with garlic bread, which I happily devour. Although I won't be able to have this same lasagna the night before the marathon (I am going to Luigi's in DC since I am running the Marine Corps Marathon), at least I know that Lasagna has given me good luck before! So, Baltimore Marathon Runners, need to find a good option for your pre-race meal on Friday the 14th? Consider the Lasagna from Little Taste of Italy! Not a runner but still want to get in on this sweet lasagna action? Not a problem - this is the ultimate comfort food! I received this press release in my email - what a great event to attend! Not only does it sound absolutely DELICIOUS, but it's all for a great cause too! Who: The hottest chefs and mixologists from Baltimore and around the country are coming together to donate their time, talent and passion to end childhood hunger in Maryland and across America. Top Baltimore establishments including Pierpoint, Charm City Cakes, B&O American Brasserie, Clementine, Mallard’s and Wit and Wisdom will offer a taste of their finest foods. What: Sample sweet and savory bites as you mingle among the area’s hottest culinary talents and food lovers. Sip craft cocktails and select wines and beer. Bid on exceptional auction items including culinary experiences, travel packages, and unique gifts. How Much: Tickets are $95 for General Admission and $150 for VIP and can be purchased by calling 1-877-26-TASTE or visiting TasteOfTheNation.org. 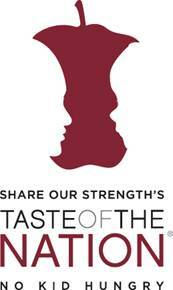 One hundred percent of ticket sales support Share Our Strength’s efforts to end childhood hunger. Why: Hunger impacts one in five children in America, and nearly 12 percent of families in Maryland. Share Our Strength is dedicated to making sure no child grows up hungry. The No Kid Hungry campaign connects kids with the nutritious foods they need to lead healthy, active lives. When: Saturday, October 15, 2011; 6:00 p.m. VIP admission, 7:00 p.m. General Admission.